A group of Israeli settlers attacked Friday evening a French solidarity delegation while visiting al-Khalil south of the occupied West Bank. 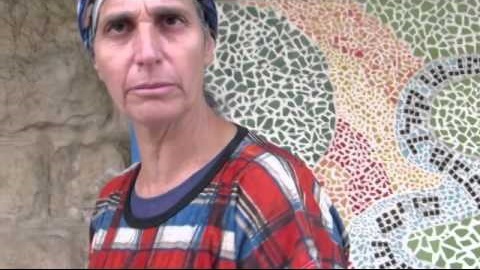 A member of the French delegation told Quds Press that the Israeli settlers attacked him and his wife in addition to the delegation members while visiting Shuhada Street that was closed by the Israeli occupation forces (IOF). The attack aimed at preventing us from witnessing the locals’ suffering, he continued. He affirmed that a group of settlers led by the extremist female settler Anat Cohen attacked his wife and the child Abe Abu Maria, 11. Israeli forces intervened and detained the delegation members including the injured child under the pretext of entering an Israeli-occupied area. The French delegation threatened to submit a complaint to the French courts against the settlers’ attack that was carried out under the protection of Israeli soldiers. Shuhada Street in al-Khalil city was closed by the IOF after the Ibrahimi Mosque massacre in 1994 during which dozens of Palestinian worshipers were shot and killed by an Israeli fanatic settler. In an attempt to defile the Islamic sanctity of the Aqsa Mosque, some Jewish settlers on Friday started their Passover holiday trying to give ritual animal offerings near the Mosque in Occupied Jerusalem. 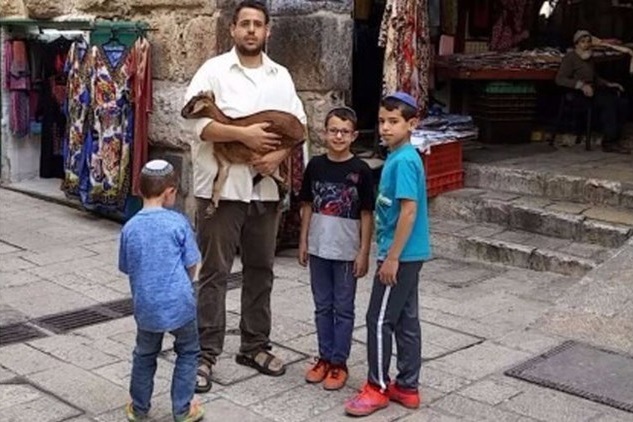 Local sources reported that two settlers carrying a goat stopped at al-Qattanin market near the Aqsa Mosque and loudly declared their intent to slaughter it inside the Mosque before policemen apprehended them. The Israeli police, for their part, stated that three Jews tried to slaughter heads of livestock as ritual offerings during the first day of the Passover near al-Qattanin Gate (one of the Aqsa Mosque's gates). The police claimed they arrested those Jewish men in order to maintain public order. Thousands of Israeli occupation soldiers and police were seen deployed across Occupied Jerusalem city to mark the first day of the Jewish Passover holiday, turning the holy city into a military barrack. Friday April 22 marks the first day of the eight-day Jewish Passover holiday. The Israeli occupation police tightened grip around Occupied Jerusalem to provide a security shield for the hordes of Israeli fanatics as they perform their sacrilegious rituals. A total of 45 beaches, besides several holy sites and markets, were prepared, at the request of the Israeli Interior Minister, for the influx of Israeli extremists during the Passover. The Israeli occupation authorities also announced their intents to crack down on Palestinian West Bankers residing or working in 1948 Occupied Palestine. Researcher Raed Fathi warned of the serious repercussions of such a celebration in a city where tension has already reached a peak due to Israeli provocations. “Over ancient times, nobody would dare call for mass break-ins at Muslims’ the al-Aqsa Mosque or slaughter sacrifices in the site. 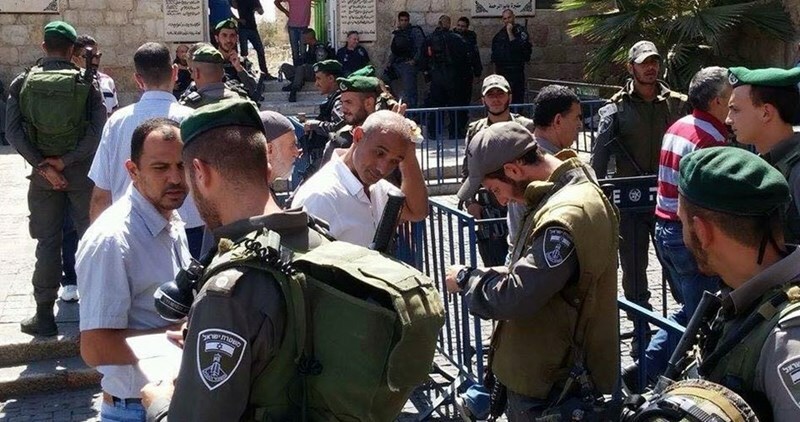 However over the past couple of weeks, Israel’s alleged temple mount gangs have been inciting for storming al-Aqsa at noontime on Friday and performing sacrilegious rituals near the Maghareba Gate,” Fathi said. “Such rituals represent a provocation to the sentiments of the Muslim worshipers. The real crux of the matter is that the Israeli occupation wants to impose a religious sovereignty over the Mosque and force a new fait accompli on the ground,” the expert further warned. The advent of the Jewish Passover culminated in a tight security cordon imposed by the Israeli occupation army on the occupied West Bank and the blockaded Gaza Strip. The Israeli occupation authorities further ruled for sealing off all military checkpoints for 48 hours starting Friday. 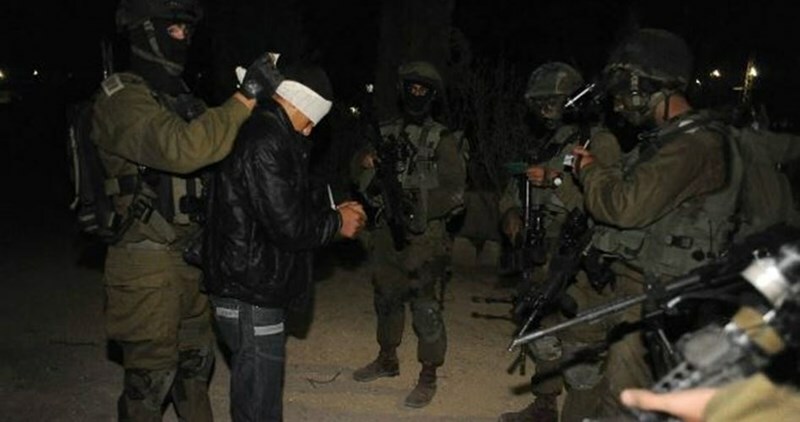 20 arbitrary abductions, bans from al-Aqsa, and interrogations summonses have also been documented since predawn time as part of a preplanned Israeli sweep across the occupied Palestinian territories. An Israeli ban also prevented elderly Palestinians (above 60 years old) living in the Gaza Strip from performing Friday prayers at al-Aqsa. An Israeli settler attacked a Palestinian child with a vehicle on Thursday, causing moderate injuries. The child, Alaa Ghaleb al-Rajabi, 16, was transported to a local hospital (al-Ahli hospital) and is in stable condition, according to medical sources. The attack took place near the Ibrahimi mosque in central Hebron, an area known for numerous violent attacks against Palestinian civilians by right-wing fanatic Israeli colonizers. According to the local news agency Ma’an, photojournalist Raed Abu Irmeileh witnessed the incident. He told reporters that the settler vehicle rammed the teen head-on, then sped away from the scene. Israeli officials have not announced any investigation, and are apparently not pursuing the perpetrator of the attack. Israeli attacks against Palestinians, particularly in the Hebron area, are rarely investigated or prosecuted by the Israeli military authorities that govern the area, according to human rights groups. The reason, according to the Israeli group ‘Breaking the Silence’, is that the military and police authorities in charge of the area are tasked only with protecting the lives and property of Israeli civilians, and have no orders to investigate or pursue charges for any crimes carried out against the indigenous Palestinian population who are the frequent target of attacks. This means that the Palestinians who are attacked have no legal recourse to pursue justice against those who attacked them. Jewish temple mount groups have incited their followers to participate in a sacrificial ceremony to be held on Friday, the first day of the Hebrew Passover holiday, at the western wall of the Aqsa Mosque. The same groups already invited settlers to participate in massive marches to the Aqsa Mosque during the days of the holiday. In a related incident, a horde of Jewish settlers escorted by policemen on Thursday desecrated the Aqsa Mosque's courtyards, which raise the ire of Muslim worshipers there and provoked them into chanting protest slogans. Local sources also said that a number of settlers left the Aqsa Mosque and then defiled al-Rahma Cemetery at the eastern wall of the Aqsa Mosque, affirming that some of them sat on graves with no respect for the Islamic sanctity of the place. Abu Khdeir was murdered in July 2014 in revenge for the kidnapping and murder of the three teenagers, Gil-Ad Shaer, Naftali Frenkel and Eyal Yifrach. Indeed, a day before Abu Khdeir’s murder, Ben-David and his accomplices attempted to kidnap seven-year-old Mussa Zalum as he walked with his mother and two brothers in Beit Hanina. The three scouted the area until they arrived at the Shuafat neighborhood in East Jerusalem, where they argued for twenty minutes about who to kidnap. “Let’s kidnap a minor. A woman screams more than a man,” one of them suggested. The Israeli Occupation Forces (IOF) stormed different neighborhoods east of the northern West Bank city of Nablus at dawn Thursday. 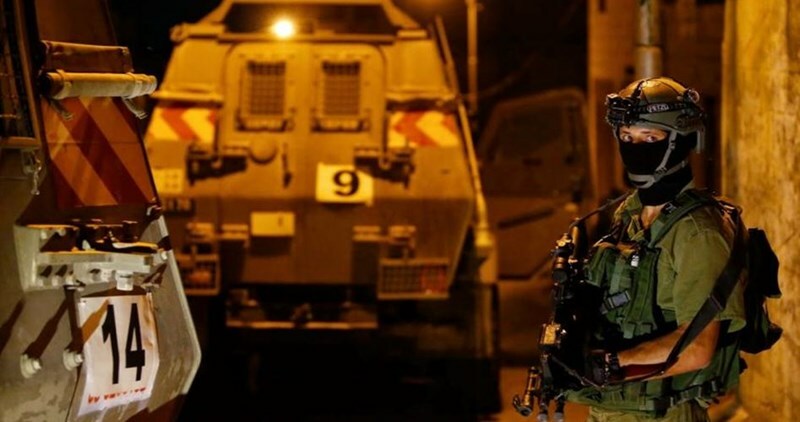 Eyewitnesses affirmed that several Israeli military vehicles stormed the city at 2 a.m. and deployed in its neighborhoods till morning hours before withdrawing from the area without reporting any arrests. On the other hand, dozens of Israeli settlers carried out overnight provocative acts at the southern entrances to the city after gathering in large numbers at Zaatara and Hawara checkpoints. Palestinian vehicles were forced to use alternative routes for fear of any possible settlers’ attack. Along the same line, Israeli forces stationed at Karama crossing, which links between occupied West Bank and Jordan, prevented the travel of 63-year-old Anwar Mouna and his wife who were on their way to Saudi Arabia to perform Umrah. After being detained for several hours, the couple was informed that they are banned from traveling via Karama crossing under alleged security pretexts. Anwar Mouna is the father of the journalist Mohamed Mouna and the engineer Fathi Mouna who were detained more than once by Israeli forces. Jewish groups in cooperation with the Israeli security authorities have finished all preparations for a new season of massive desecration against the Islamic sanctity of al-Buraq Wall (Wailing Wall in Hebrew myths), which is the Aqsa Mosque's western wall. 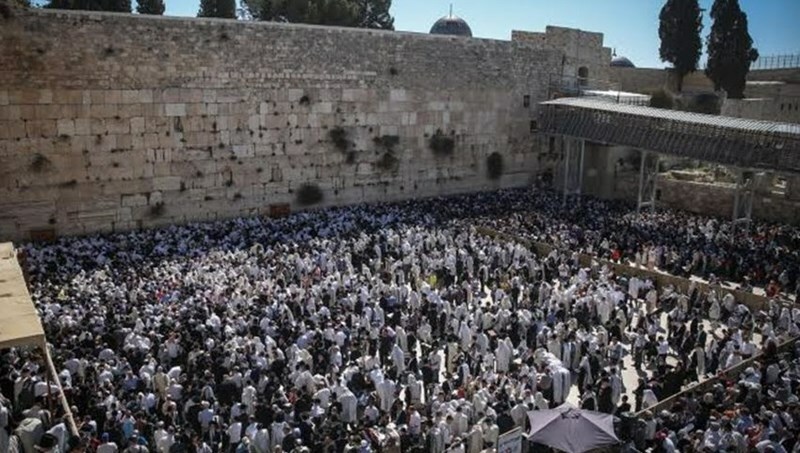 This season of Jewish defilement against al-Buraq Wall and its plaza has started as the UNESCO confirmed, in a recent resolution, that the Wall and its plaza are solely Islamic holy sites. Each year, the Jewish desecration of al-Buraq Wall and its precincts reaches its highest levels during the Passover (April) and Sukkot (September-October) holidays, where one day of each holiday is chosen to hold massive ritual rallies at the western wall for the reception of the so-called "priestly blessing". Tens of thousands of Jews led by scores of senior rabbis participate in the priestly blessing days organized during these two holidays. Six youths from Binyamin region in West Bank confess to having carried out attacks against Palestinians; they have reenacted several of the incidents; they are being investigated for similar offenses carried out in 2008-9. Six youths from the Binyamin region of the West Bank have admitted to involvement in security offenses against Palestinians, the Shin Bet cleared for publication Wednesday morning. They are suspected of torching vehicles, throwing Molotov cocktails and gas grenades at inhabited homes and assault. According to the Shin Bet, shortly after their arrest, the suspects admitted the acts attributed to them, and in recent days they have even reenacted several of the incidents. The six suspects - Pinchas Sandorfi, 22, Itamar Ben Aharon, 20, Michael Kaplan, 20, two boys aged 16 and 17, and a soldier - all of whom live in a settlement in Binyamin. Three of them are brothers, and the actions attributed to them are believed to have taken place in the Gush Talmonim area near Ramallah. The detainees are also being investigated on suspicion of similar offenses carried out in 2008 and 2009. 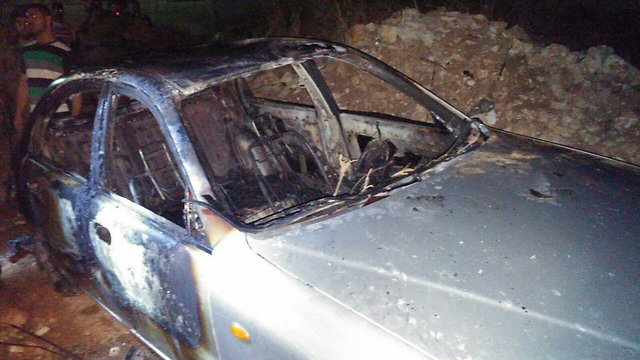 The Shin Bet and the nationalistic crimes department of the West Bank police investigation revealed that the members of the cell, who were active for a long time, are suspected of torching a Palestinian vehicle in the Palestinian village of Beit Illu a few hours after the murder of Na’ama and Eitam Heinkin last October. In addition the cell is suspected of attacking a Palestinian in July 2015, and of torching another Palestinian vehicle in 2014. Moreover, five of them are suspected of throwing a Molotov cocktail at a house in the Palestinian village of Mazra’a al-Qibliya last November 20 and of throwing a gas grenade at a house in the village of Beit Illu last December. 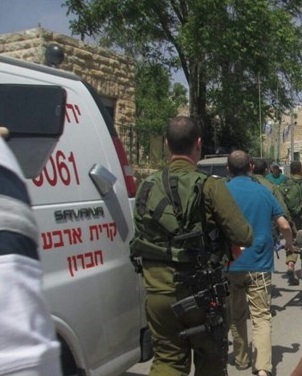 The father of the three detained brothers detainees is the rabbi of the settlement. It should be noted that ‘ticking bomb’ investigative techniques, which involve physical pressure, used on those involved in the Dawabshe murder incident, were not used in the suspects. The nationalistic crimes department and the Shin Bet used various types of technologies during the investigation. Officials involved in the investigation related that the case involved long-term intelligence work, which resulted in the discovery of the cell which operated against Palestinians under the radar for a long time. 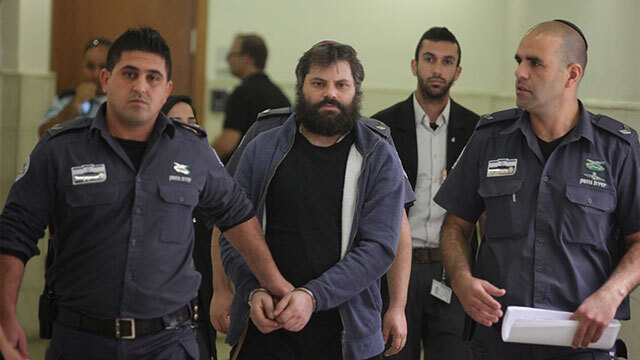 Aharon Roza of the Honenu organization, one of the lawyers representing the suspects, said, "In contrast with all sorts of rumors and half-publications, most of the offenses investigated in this matter involve no harm to human life, and most are no more than a scuffle between people. Regardless of the type of offenses being investigated, this method of preventing meetings with an attorney in every investigation whose headline is 'security investigation' is not proper or right." Hai Haber of the Honenu organization, an attorney representing the suspect who is currently an IDF soldier, said, "Today is another dark day for the state of Israel, which purports to be a democratic state. Unfortunately, the investigative authorities have apparently not come to the appropriate conclusions from the torture and human rights violations of the Duma affair (in which the detainees, suspected of the arson attack that killed several members of the Dawabsheh family in Duma, were supposedly tortured by the Shin Bet. -ed), and here things go again, and a troubling reality in which prohibiting a suspect from meeting an attorney becomes the rule, and granting a person's basic legal right to speak to an attorney before an interrogation is the exception to that rule." Adi Keidar, also an attorney from the Honenu organization, who is representing some of the suspects, said, "In the age of Zadorov and Duma, I can only express my astonishment at the continuation of the corrupt method that focuses only on gaining confession by improper means and with no legal advisement. The justice system is becoming one that prevents (people from getting) legal advisement and abandons suspects, and this should worry every citizen of the state." 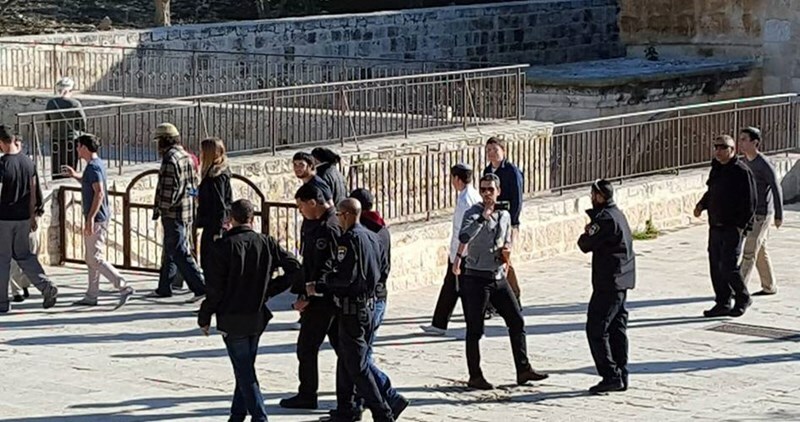 Groups of Israeli settlers stormed Wendesday morning al-Aqsa Mosque via the Israeli-controlled al-Magharibeh gate under heavy police protection. 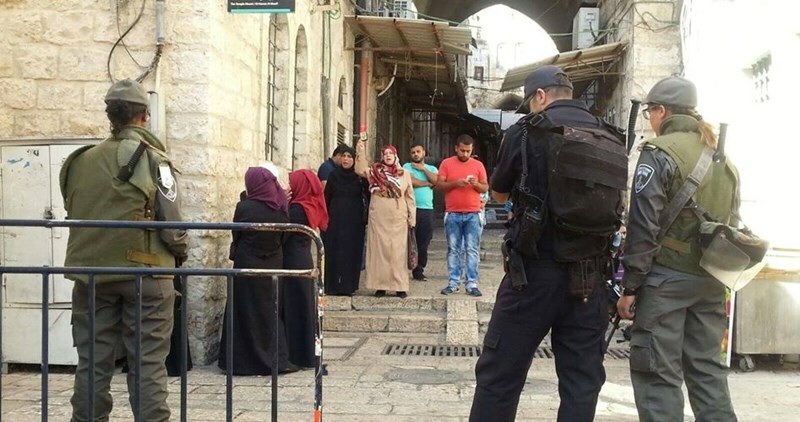 The settlers tried to perform Talmudic rituals in the holy shrine in clear provocation to the Palestinian worshipers who started shouting Takbeer in protest against the settlers’ provocative presence in the Islamic holy site. Women who were denied entry to the compound continued to protest outside al-Silsila Gate raising posters and chanting slogans expressing their right to pray in the compound. Tensions have been running high in occupied Jerusalem since October 2015 after Israel imposed restrictions on the entry of Palestinian worshipers into al-Aqsa Mosque while allowing the settlers’ free access to the compound. The Mosque is Islam’s third holiest site after Masjid al-Haram in Makkah and Masjid al-Nabawi in Medina. 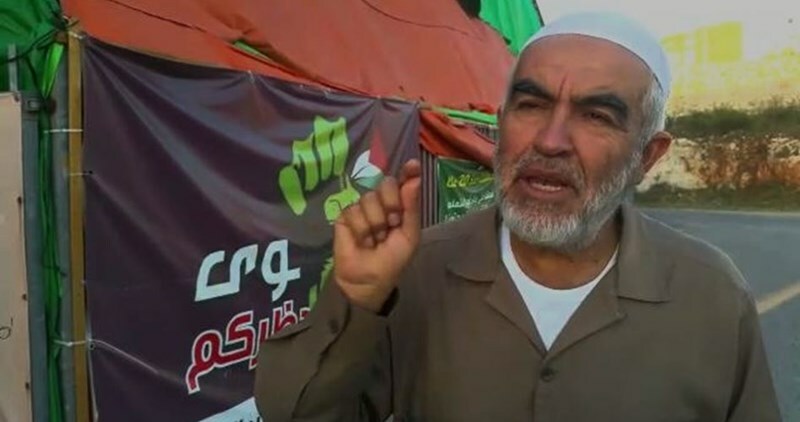 Head of the Islamic Movement in 1948 Occupied Palestine, Sheikh Raed Salah, warned of dangerous Israeli schemes to Judaize the holy al-Aqsa Mosque. Talking to the Q-Press Center, Sheikh Salah warned of the swift surge in Israeli schemes against the al-Aqsa Mosque, particularly with the advent of the Jewish Passover holiday. He spoke out against the campaign launched by the Israeli occupation forces in Occupied Jerusalem and 1948 Occupied Palestine so as to wipe out Muslims’ presence at the al-Aqsa and perpetrate spatio-temporal division. Earlier, on Monday evening, fanatic Israeli rabbis joined a re-enactment of the Passover sacrifices in al-Zaytoun Mount, near al-Aqsa. Passover rituals are expected to kick off Sunday, April 24.